Donald M. Grant, Publisher, West Kingston, RI, 1975; 217 pp. ; First Edition. Limited Edition. One of 1654 copies. 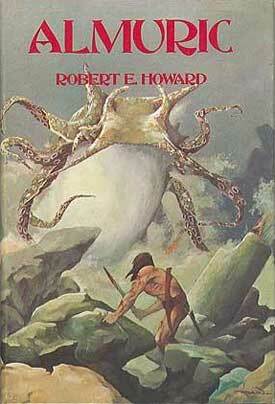 This book was written late in Howard's short but vastly prolific career, was his first bold attempt at a fantastic adventure novel set in another world. It was written in the Edgar Rice Burroughs-Otis Adelbert Kline tradition -- probably at the urging of Howard's literary agent, Otis Kline -- and originally appeared as a three-part serial in 1939 Weird Tales magazine subsequent to Howard's death. Earthman Esau Cairn, a fugitive on his native planet, is transported to Almuric, a barbaric and warlike planet of the remote solar system, where he became Esau Iron- hand. Here he is beset by apelike humans, winged demons, and a multitude of strange monsters. His adventures are chronicled in the best Howard manner, full of swift and savage action against an incredible background, Fine in a fine dust jacket. A beautiful production, illustrated by David Ireland. NOTE: Owner's bookplate is adhered to inside of front board.